Starting at the point where the boundary between the parishes of Kingston and St. Andrew intersects the south-western boundary of the main road leading from Kingston to Yallahs, and proceeding south-easterly along the said main road boundary to its junction, in the vicinity of the Harbour View round-a-bout, with the north-western boundary of the main road from the said round-a-bout, to Port Royal; thence south-westerly along the said boundary of the last mentioned main road to its intersection with the boundary between the parishes of Kingston and St. Andrew, which crosses the Palisadoes Peninsula; thence south-easterly across the last stated main road and along the said parish boundary to its junction with the High Water Mark on the southern shore of the Palisadoes Peninsula; then south-westerly in a straight line for an approximate distance of seven thousand, seven hundred and eighty-five (7785) metres to the navigational aid buoy known as East Middle Buoy, having coordinates 17° 54' 45"N and 76° 47' 07"W; thence south-easterly in a straight line for an approximate distance of seven thousand five hundred and ninety five (7595) metres to the buoy known as Turtle Head Rock Buoy having coordinates 17° 54' 25"N, and 76° 51' 24"W; thence north-easterly in a straight line for approximately two thousand four hundred and fifty (2450) metres to the buoy known as West Middle Rock Buoy, having coordinates 17° 55' 39"N, and 76° 51 02 W; thence north-easterly in a straight line for approximately eight hundred and forty (840) metres to the fixed beacon called Harbour Shoal Beacon; thence north-easterly in a straight line for an approximate distance of one thousand three hundred (1300) metres to the fixed beacon known as Pelican Spit Beacon; thence north-easterly in a straight line for approximately one thousand and sixty (1060) metres to the fixed beacon called Bloomfield Beacon; thence easterly in a straight line for an approximate distance of four thousand, one hundred and thirty (4130) metres to the fixed beacon called Tupper Beacon; hence easterly in a straight line back to the starting point. Port Royal was once called "the richest and wickedest city in the world". When only a sand spit, it was first used by the Tainos as a fishing camp. When the Spaniards arrived in Jamaica, they used the spit for cleaning, refitting and caulking of their sailing vessels. When the British invaded Jamaica in 1655, immediately realising its strategic importance, they started to put fortifications in place. During the 17th century, it was the virtual capital of Jamaica, and also a headquarters for buccaneers and pirates who brought in much of the treasure they looted on the Spanish Main. Chief among the buccaneers was Henry Morgan who sacked Camaguey, Port Bello, Maracaibo and Panama. Morgan was later knighted and made Lieutenant Governor of Jamaica. He died at Port Royal in 1688. By 1692 Port Royal had become an important economic centre, but on June 7, of that year, it was destroyed by an earthquake. A large portion of the town sank into the sea, while about two fifth of the population-died either in the earthquake or in the plagues and pestilences that followed. Almost immediately the houses and fortifications were rebuilt on what by then was an island separated from the rest of the Palisades, but in 1703 a fire destroyed the entire town which had been rebuilt mainly of wood. Hurricanes in 1712, 1722 and 1726 ensured that Port Royal would never again rise to its former glory, as all the merchants shifted across the harbour to settle in Kingston, a less healthy, but safer site than Port Royal. However, Port Royal did not decline entirely, as in the 18th century, it enjoyed renewed fame as a British Naval Station. Among those associated with it were the illustrious Horatio Nelson and the hard-fighting admirals Benbo	w, Vernon and Rodney. After the Napoleonic wars Port Royal declined in importance. The Naval Dockyard was closed in 1905 and moved to Canada; the 1907 earth¬quake damaged the town while the garrison left in the 1950s. Hurricane Charlie of 1951 swept over Port Royal leaving only a few buildings of its historic past. Today with the warships and the soldiers gone, Port Royal has become a quiet fishing village, but it is one of the most important historical and archaeological sites in Jamaica-let it never be forgotten that for over 200 years, Port Royal was England's biggest naval base in the Caribbean, so strong and powerful, that no enemy dared attack it. The original Church was destroyed by the great earthquake of 1692 in Port Royal. A second Church which was constructed shortly after was destroyed by fire in 1703. A plaque outside the vestry of St. Peter's Church, records that it was rebuilt between 1725 - 1726. 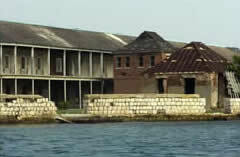 Fort Charles, built in 1656, is the oldest fort in Jamaica. Originally named Fort Cromwell, it was renamed in 1662 to honour Charles II, restored King of England. The original armament of 10 guns was increased to 36 in 1667 and to 104 in 1765. When built, the fort was almost completely surrounded by water, but the area around it eventually silted up. 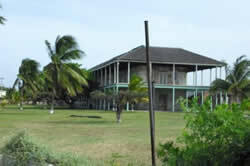 This fort, one of six located in Port Royal, served to guard the entrance to the Kingston Harbour. It was the only one of Port Royal’s forts to survive the 1692 earthquake. Damaged, it was reconstructed in 1699 by Colonel Christian Lilly, chief engineer of Jamaica. This lopsided building is called “the Giddy House”. It was built in 1888 and was the old Royal Artillery Store for the Victoria Battery. The Earthquake of 1907 shifted it to its present 45 degree angle. On entering the building, people often feel a strange sensation of being giddy or off balance, caused by the building’s tilt-hence its name-the Giddy House. Built around 1818, the Historic Naval Hospital is an early example of the use of cast iron in construction. It was designed by a team headed by naval architect Edward Holl and constructed using the labour of enslaved Africans. The prefabricated cast iron units were imported from Sheffield, England, and the bricks were made from local clay. The building rests on a raft foundation, that is, all supporting iron columns are linked beneath the surface. The hospital was built on the foundations of an earlier one erected in 1743 and destroyed by fire in 1812. Outbuildings included kitchens, staff quarters, isolation ward, mortuary and a storeroom. The services at the new hospital received high praise from those who were treated there. One of the first to be nursed at the hospital was Captain Botelier, RN. Over the years and since the naval station at Port Royal closed in 1905, the building has been used for a variety of purposes.